This article is my personal opinion why one should learn C# language over others and how to get started with C#. If you want to get into computer programming, C# is one of the easiest programming languages among them all. Here are the reasons why you should learn C#. It supports all the basic object-oriented language features including encapsulation, polymorphism, and inheritance. Besides common data types, C# also supports modern complex data types and features such as partial classes, extension methods, anonymous types, lambda expressions, asynchronous programming, and tuples. C# is a type safe language. All variables and classes in C# are a type, and all types are derived from the object, the object type, and are type safe. Automatic memory management with the help of the garbage collector makes sure that program does not leak memory and automatically manages life cycles of objects and releases once objects are not required. C# is the most versatile programming language. Not only can you build Windows client applications, but you can also use C# to build Web and mobile apps. Windows client applications using Windows Forms, WPF and UWP. Web applications with ASP.NET and ASP.NET Core. Native iOS and Android mobile apps using Xamarin. C# and .NET Core 3.0 are one of the fastest platforms among all software development platforms. C# compiler has been optimized from the ground up. C# is an open source programming language. The language compiler is available on Github. C# language is one of the fastest evolving programming languages in the world. Unlike other programming languages, C# development is fully supported by a committed staff of Microsoft employees. The current version of C# in build is C# 8.0. C# 7.x already had several advanced features added to the language. C#, with the support of Web Assembly and Razor (Blazor), can run in a web browser. Blazor is a single page web app framework built on .NET that runs in the browser via WebAssembly, and is based on HTML, CSS, and other standard web technologies. Blazor makes heavy use of Razor, a markup syntax for HTML and C#. Browser + Razor = Blazor! A Blazor application can be deployed as a set of static files without the need for any .NET support on the server. C# language is supported by some of the world’s most popular IDEs and editors. Visual Studio is the most popular, productive and advanced IDE for developers. Millions of developers use Visual Studio each day. Open source code editor, Visual Studio Code is one of the most loved advanced code editors for software developers. Check out Visual Studio 2017 Productivity tips to see how productive and advanced Visual Studio is. Not only is C# language supported and maintained by Microsoft, but it also has a strong community support. More than 5 million developers use C# language. .NET Core and C# compiler are open source and the adoption is growing in open source community. C# Corner is one of the largest developer communities for C# and .NET Developers with millions of visitors each month. C# programming language is one of the most versatile and modern programming languages in the world. Not only is C# easy to learn and adapt, C# also has good strong support from the community, as well as support from the most valuable company in the world, Microsoft. 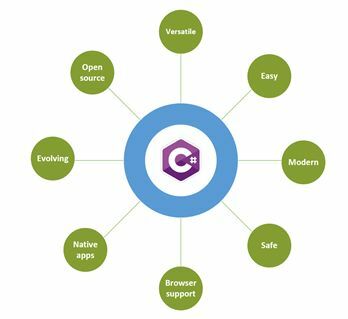 C# can be used to write almost any type of software including console apps, back end services, mobile apps, windows apps, Websites, blockchains, AI, and cloud applications.